In June, the European Space Agency's Rosetta mission operators received a welcome surprise. Rosetta’s landing probe Philae has been silent since November when it set down awkwardly on the surface of comet 67p/Churyumov-Gerasimenko. But this month, Philae sent signals to its mothership Rosetta. Rosetta and Philae were launched in 2004 on a ten-year journey to reach and explore 67p/Churyumov-Gerasimenko. Philae is the first spacecraft ever to have contacted a comet, and the fact that it functioned after landing and sent back observations from the surface qualify the landing as successful, even if things did not go as planned. Key systems on Philae that were designed to "make it stick" to the comet upon landing failed to go off as designed. A thruster that was supposed to push the robot firmly onto the surface and prevent it from bouncing off did not function, and a harpoon system, intended to anchor it permanently to the comet, failed to deploy. 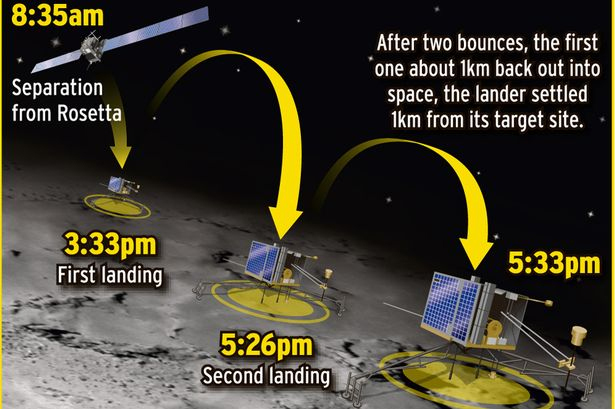 So Philae bounced in the comet's extremely low gravity environment—bounced more than once, in fact. When it finally came to rest, mission controllers did not know exactly where it was. To make matters worse, Philae settled down in the shadow of a cliff, with its solar panels turned to an unfavorable angle. Fifty-seven hours after its final landing, Philae's battery power was depleted, and it went silent. 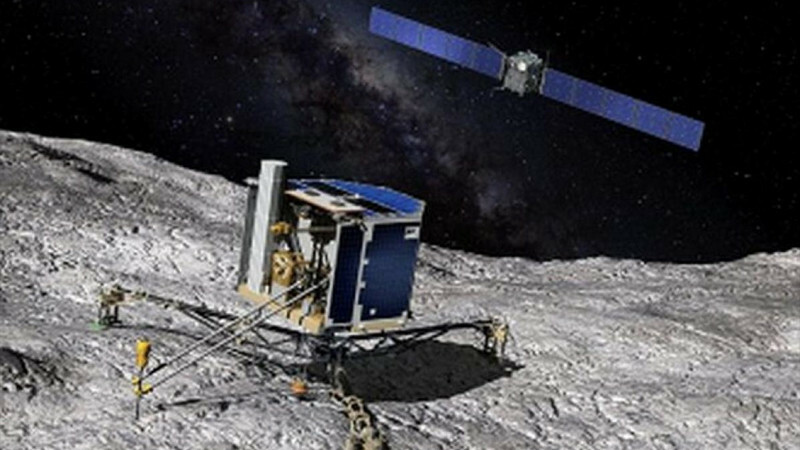 There were hopes that, as comet Churyumov-Gerasimenko got closer to the sun, and perhaps Philae's solar panels achieved a more productive face-off with the sun's light, its batteries might recharge to the point where it could come out of its accidental hibernation—which has now happened! Philae's first "pings" came on June 13 and 14, and, following a brief relapse into silence, June 19. Mission operators are assessing Philae's state, but are hopeful that its historic mission is not over yet. In the meantime, mothership Rosetta has been tagging along with the comet since it arrived there in August 2014, making observations and measurements of the comet's nucleus and the shroud of gas and dust it has developed as it heats up in the increasingly intense sunlight. The comet will reach perihelion, its closest approach to the sun, on August 13th, and afterward will move away from the sun again, toward the more distant end of its six-and-a-half year elliptical orbit. 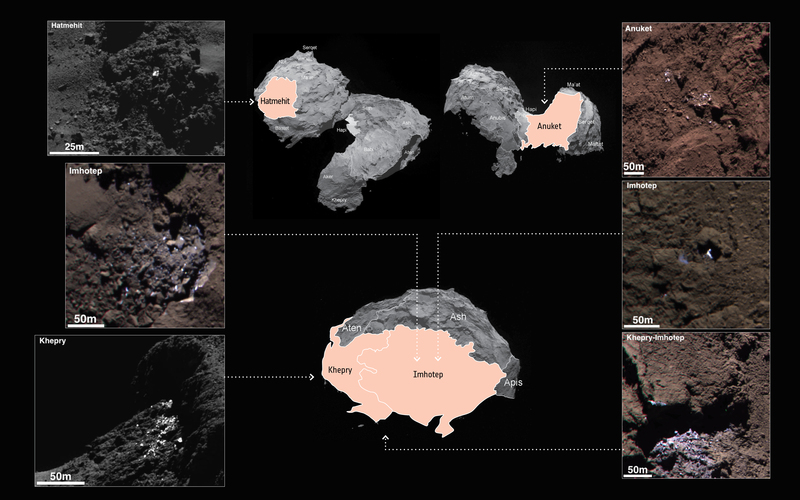 The comet's surface has been mapped into 19 different regions with distinct boundaries comprising five diverse types of terrain: dust-coated areas; rugged terrain filled with pits and other depressions; smoother patches; and different exposed rocky zones, including localities of exposed water ice. The comet's average density is 470 kilograms per cubic meter—which tells scientists that if, as it is believed, the comet's overall composition is mostly water ice, then the comet is highly porous, with as much as 70 to 80 percent of its volume dominated by small empty chambers. 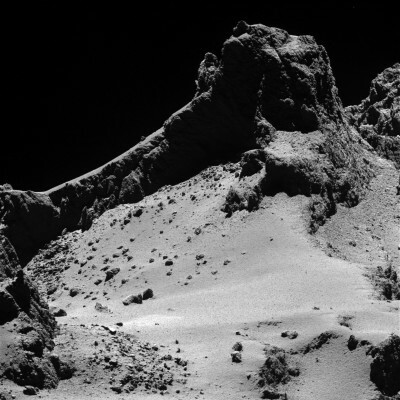 Jets of gas and dust erupting from within the warming comet emerge largely from the "neck" region between Churyumov-Gerasimenko's distinctive two-lobed shape. All of the data and discoveries acquired from this comet provide insight into the conditions under which it formed over 4.5 billion years ago, when our solar system was young and the planets still in their infancy. It has been said that primordial objects like comets are like time capsules of information about the early formation of the solar system, and missions like Rosetta hold the key to unlocking them. Rosetta's continued study of Churyumov-Gerasimenko will only increase our understanding of our planet's origin. There is more good news than Philae's hopeful resuscitation. Whatever Philae is able to achieve in the days or months ahead, the Rosetta mission itself has been extended nine months beyond the nominal December 2015 end time, giving scientists the opportunity to observe the comet's behavior over a longer stretch of its orbital cycle. Rosetta has observed the comet since it was relatively far from the sun, and has been monitoring the effects of rising solar radiation. Understanding how the comet behaves as it moves back toward the colder environment farther from the sun will give us a more comprehensive view of its evolution.